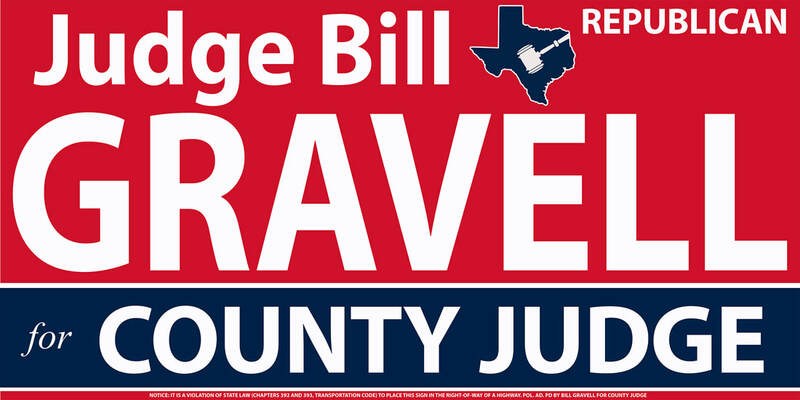 GEORGETOWN, TX – Conservative Republican Judge Bill Gravell officially launched his campaign for Williamson County Judge today when he filed the appropriate paperwork to be placed on the March 6th primary ballot. Gravell said Saturday, in front of hundreds of supporters, that Williamson County must have strong conservative leadership to manage growth and keep our county safe. Since taking office in 2013, Gravell and his staff have won several state and national awards for their conservative efforts. In 2013, his office received the award for "Collection Improvement Program of the Year in Texas". In 2015, they were chosen for Tyler Technologies' national “Public Sector Excellence Award”. In 2015, the JP3 office was the first court in Texas to receive the national "Innovation in Business Process in America" award for contributions to the judiciary in technology and court business processes. In 2015, Gravell was appointed to the Texas Judicial Council by Chief Justice Nathan Hecht and later that year was selected “Judge of the Year” in Central Texas. In 2016, Gravell was chosen to be one of 24 county elected officials to attend the Texas Association of Counties leadership school in Texas. From 2016-2017, Gravell served on the teaching faculty for Judges in Texas. In 2017, he was one of 15 Judges chosen in America to attend the National Judicial College for specialty training in the area of Judicial Coaching and Mentoring. Gravell also serves as chairman of the Data Committee for the Office of Court Administration and the Criminal Justice Committee. In 2017, Gravell was nominated by the Chief Justice of Texas and voted “2017 Judge of the Year in Texas”. Gravell is a graduate of University of Mary Hardin-Baylor in Belton. He and his wife, Jill live in the Jarrell Community and they are active members of River Rock Bible Church in Georgetown. They have two adult children and are the proud grandparents of five grandchildren.